Raising Digitally Responsible Youth – Venue changed to Moscrop!!! 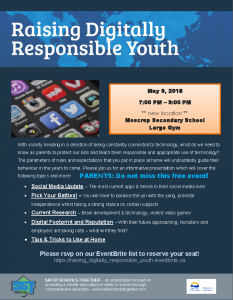 The tickets for “Raising Digitally Responsible Youth” on Wednesday, May 9, originally scheduled to be at Burnaby Central, have sold out and there is now a large waitlist. To accommodate everyone we’ve moved the location to the large gym at Moscrop Secondary.